Sometimes it pays to skip the remodel! Rather than pulling out an outdated brick fireplace, save money and still transform this feature into one you'll enjoy for seasons to come—with just a bit of paint. Sometimes, even despite attentive maintenance and care, brick masonry fireplaces amass a fair amount soot, mildew, and efflorescence that cumulatively dates a modern home. While a teardown of this brick feature for something more modern can be cost-prohibitive to many homeowners, you can still brush off outdated design before winter’s cold arrival by brushing up your fireplace exterior—with paint. 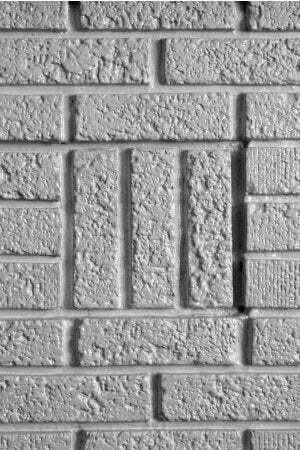 Unlike drywall or wood, brick has a unique texture that should be taken into consideration when painting. Follow this tutorial to fix up your bare brick masonry fireplace in under a weekend. Due to the tendency of brick to accumulate grit, you should wet and clean the brick fireplace prior to painting it to ensure better paint adhesion. Using a stiff-bristle brush doused in soapy water, first scrub the face of the brick fireplace with a brush to remove dirt or efflorescence—that is, white, powdery, mineral deposits. If your fireplace also contains leftover soot, follow with a mixture of 1/2 cup of trisodium phosphate and 1 gallon of water. Then proceed to remove any visible mildew with a solution of one part bleach to three parts water. Sponge the diluted bleach over your brick, let it soak in for for half an hour, and scrub the surface with a wire brush. Once you’ve wrapped up cleaning, allow the brick to dry for at least 24 hours before painting. Inspect the fireplace for small cracks in the brick. If you find any, pick up some acrylic caulk from your nearest home improvement store and use it to fill in. Check your bottle’s instructions for required dry time before you move on. Using painter’s tape, cover the areas around the fireplace that you do not want to paint, such as where the brick meets the floor and walls. 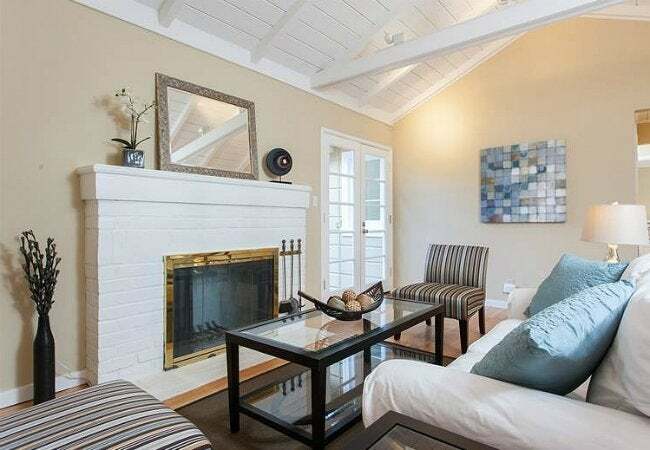 Protect the floor and the fireplace hearth from splatter by laying out a drop cloth. Pour your masonry primer into one of the 5-gallon buckets and insert a bucket screen on end; this painting tool will assist in both minimizing mess and achieving an even coat on your roller. Now dip the roller into the bucket, roll it along the screen, and repeat until it’s completely loaded with primer. Carefully apply the first coat to the entire surface of the brick, ensuring that you cover the surface as well as the mortar joints. Switch to a brush to paint deep joints that the roller misses. If your brick structure reaches the ceiling, you may also opt to bring in a telescopic roller extension pole to help you access hard-to-reach areas near the top of the fireplace. Wherever you had cleaned off efflorescence in Step 1, go back and apply an additional coat or two. Then, wash up your painting tools and allow the primer to dry completely overnight. The next day, set out to prep your acrylic latex paint the same way you had your primer in the second 5-gallon bucket with its own bucket screen. (While you can choose any paint finish, a matte paint really complements the natural texture of the brick.) Then, dip your roller into the bucket and coat it evenly with paint. Generously apply a top coat of the paint to the brick using overlapping strokes to cover nooks and crannies as best as possible, and leave it all to dry. Perform any paint touch-ups as desired with the brush, and then give all of your tools a thorough wash before the paint dries. When you’re finished, pull back the painter’s tape and the drop cloth from the fireplace area. If you encounter paint splatter where it shouldn’t be, just wipe it away using a soft cloth damp with warm water—the sooner, the better! Otherwise, all that’s left to do to enjoy your newly refreshed fireplace this season is to stock up on kindling.